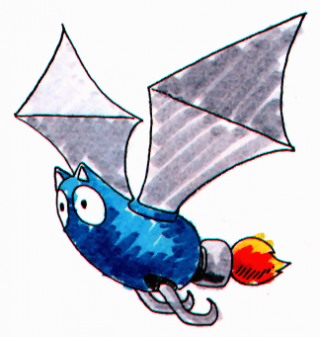 The Batbrain, called Basaran (バサラン) in the Japanese manualMedia:Sonic1 MD JP manual.pdf, is a bat-esque Badnik found in Marble Zone in the 16-bit version of Sonic the Hedgehog. The Batbrains hang onto ceilings, then swoop down and fly around when approached, and then they come back to the ceiling. They can be easily destroyed by jumping. They do not appear in the 8-bit version, but sprites for the Badnik exist in the game's data. Batbrains later made a return in the 2012 version of Sonic Jump, where they can be found in Blue Sky Zone, behaving just like they did in Sonic 1. These Badniks can only be defeated by jumping into their underside. Batbrains made a return in both versions of Sonic Lost World, where they can be found in the caverns of Windy Hill Zone 2 in the Wii U/PC version and in Windy Hill Zone 2 in the Nintendo 3DS version. They hang from surfaces in groups, then swoop down to attack. They can be destroyed with any kind of attack. They return again in Sonic Mania, found in the cavernous parts of Green Hill Zone in both Act 1 and Act 2, maintaining their same attack pattern from Sonic 1. This page was last edited on 28 September 2018, at 15:27.